All the spots for the 2019 Chili Cook-Off have been filled! However, if you'd like to be added to a waiting list in case of cancellation, please call the Chamber Office at 815-469-3356. Join us for a great day of Fun in Frankfort! As part of Winter on the Green the Chamber will host its Annual Chili Cook-Off. There are both Amateur and Professional categories so everyone can join in the FUN! 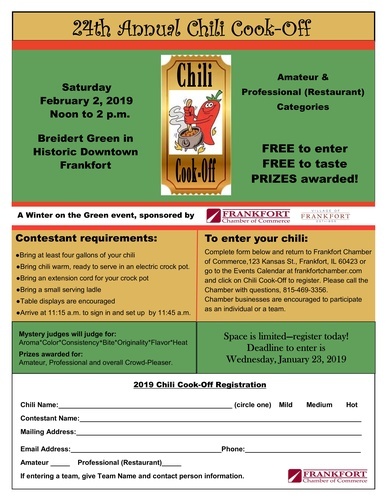 Not a chili maker - that's okay - come our to help taste and judge!